Laura's Story of Abuse - Angry Hopeless and Alone Then She LeftAbout Emotional Abuse| About Domestic Violence| Verbal Abuse: "The second marriage was for three years in 08 until Jan. 2012, when I just got divorced. I felt like he was all right because he never laid a hand on me. There was just lots of verbal abuse and intimidation." Check this out--My Brother, Dr. Marshal and myself got a great review at Metaphyscology Online Reviews--it was done by Kumari de Silva and we really want to thank her for the heads up! Review - Respect-Me Rules - Self-Help: ""Targets" as described in the Respect-me-Rules are people who respond to aggression with increased compliance thus "training" their abusers that rude behavior is an effective means of communication. The dynamic between the two partners can be upset by changes in the target’s behavior, regardless of whether the abuser changes. This is important, because as the authors point out, even if the target feels the abuser is at fault, we have no control over what others do. (emphasis mine.) Therefore, if targets wish to see change in the relationship, change they must." And to prove what we always say--its not just to women--women abuse too. So here's the deal. My bf doesn't always call or pay attention to me. When this happens I tend to get very verbally abusive. I say the things that really get under his skin. If we don't talk for a day, it doesn't bother me, but if it's day 2 or 3 then I start to get really angry. It wasn't always like this. I used to feel safe and secure in the relationship and now I don't. This pattern happens in all my relationships. He says that it doesn't have to do with me that he just needs time for himself and "space", but a nagging feeling keeps telling me that it's my fault he doesn't want to spend time with me or call. " I married a Cop, and need protection from him! This site has been tremendously helpful. I have in my relationships, experienced all forms of abuse. Emotional and verbal abuse is BY FAR the hardest to recover from. No one can see the bruises to know that I needed help... THey just saw this cool guy that I was married to... Such a lucky girl. Cops are notorious for being abusive to their spouses and the spouses don't know where to turn... The cops are friends with their abuser. Where do you turn? But there is very little information to be found on how to deal in this touchy situation, so thank you! I married my high school sweetheart at the tender age of 19. Like a turning on a light switch, he immediately began to physically and sexually abuse me. I quickly left feeling it necessary to leave the state to protect myself. I headed West with fantasies in my mind about a strong man that could finally make me feel safe. I met and became good friends with a police officer. If anyone could keep me safe it was a cop. So I thought." Kellie found the abuse in her life and the tool she used was journaling. Writing about it, keeping notes, keeping our mind fresh is very important in the world of abuse--one of themain points to make sure that wehn they say "You're crazy, that never happened." YOu can look in the journal and see sure nuff, it did. Read Kellies story..you might want to try it. About Verbal Abuse Journals| What Is Verbal Abuse | About Emotional Abuse | About Domestic Violence: "Kellie reached out to others and shared her abusive experience on her blog. The support of her readers helped her find the courage to leave the marriage. Kellie now advocates against domestic violence full-time. Helping women cope with abuse while in the relationship and supporting them as they leave and heal is her passion." Can Verbal Abuse Hurt a Dog? Well verbal abuse hurts women, men, mothers, fathers, children and dogs? I would say we have to look at it and we know that if someone abuses a dog, they are very likely to abuse their partner. Its a red flag for us. Soooo, how is your abuser with your animals? 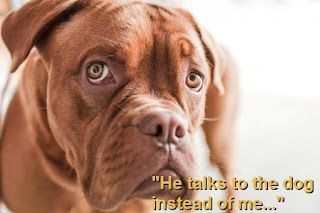 Can Verbal Abuse Hurt a Dog? - Yahoo! Answers: "No, I am not crazy... But my dog stayed at my step-grandmother's house while I was hospitalized. There was another dog there (her) dog a pesky little rat we will call a chiuawana or PEPE. This dog would not leave my dog alone for the life of her. I feel my dog got tired of this dog bothering her, and not being walked, I walk my dog 4x a day. Step-GM doesn't walk her dog, just throughs it out in the back yard. Well, my dog peed in house a few times, and when she did **** hit the van verbally to my dog. Call her an embarrassment, you should be ashamed of yourself, I hate your behaviour. I just don't think you should speak down to anything excpet maybe a murder or criminal."